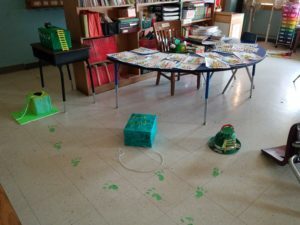 I have to report that despite our best efforts and creative leprechaun traps, the clever leprechauns eluded us this year. 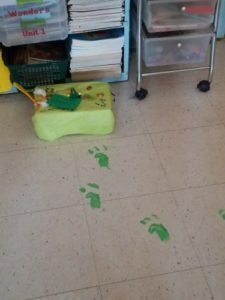 They made a mess in our classroom, left behind footprints, and managed to escape without getting caught. However, they did leave behind some treats for us. I guess we will have to try again next year. Maybe we’ll get lucky. What would you do with a pot of gold? Oh the possibilities! Graphing with Lucky Charms. Fun and tasty! 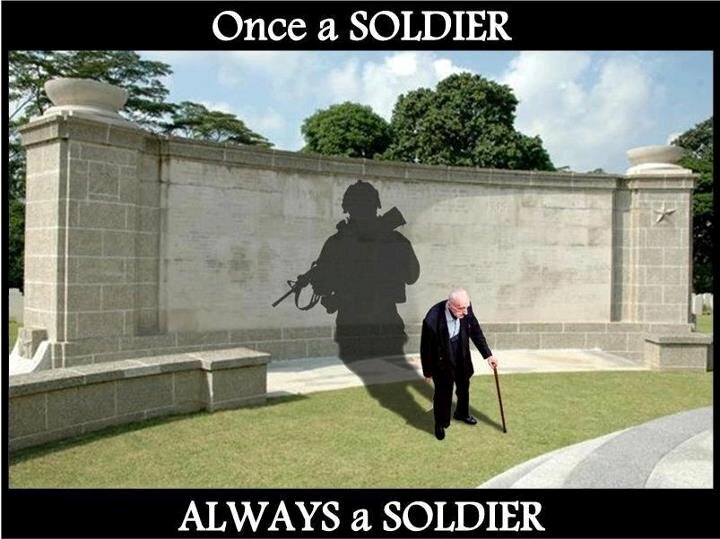 This entry was posted on March 24, 2019. Our school participated in the International Stand Up to Bullying Day by wearing pink shirts. We read stories and discussed the importance of standing together and showing kindness towards each other. 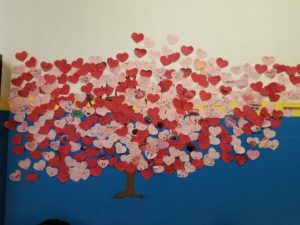 Our class worked with our Big Buddies to write messages of kindness for our school “Kindness Tree”. 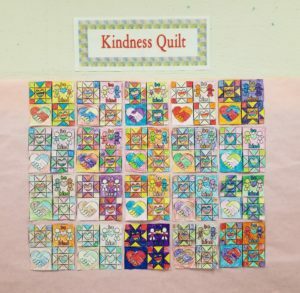 We also made a Kindness Quilt to show our unity in spreading kindness. The idea of wearing a pink t-shirt was conceptualized by two Nova Scotia high school students back in 2007. Travis Price and David Shepherd witnessed a fellow student being bullied for wearing a pink shirt to school, so they decided to take a stand. “David Shepherd, Travis Price and their teenage friends organized a high-school protest to wear pink in sympathy with a Grade 9 boy who was being bullied…[They] took a stand against bullying when they protested against the harassment of a new grade 9 student by distributing pink T-shirts in their school. 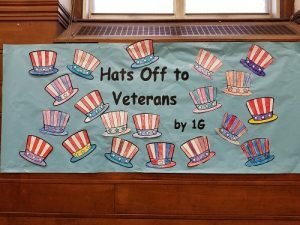 The idea of supporting and helping one another is fostered at many levels in our school. Students model for each other what true kindness looks like. The message is kindness begins with our own words and actions. Just one extra step of thoughtfulness and kindness can have a tremendous impact for someone! 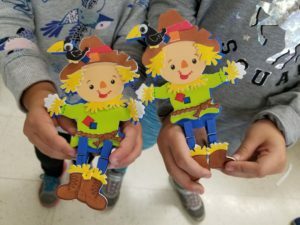 This entry was posted on March 2, 2019 and tagged buddy class, special event. The first grade celebrated Chinese New Year with a day of special activities. 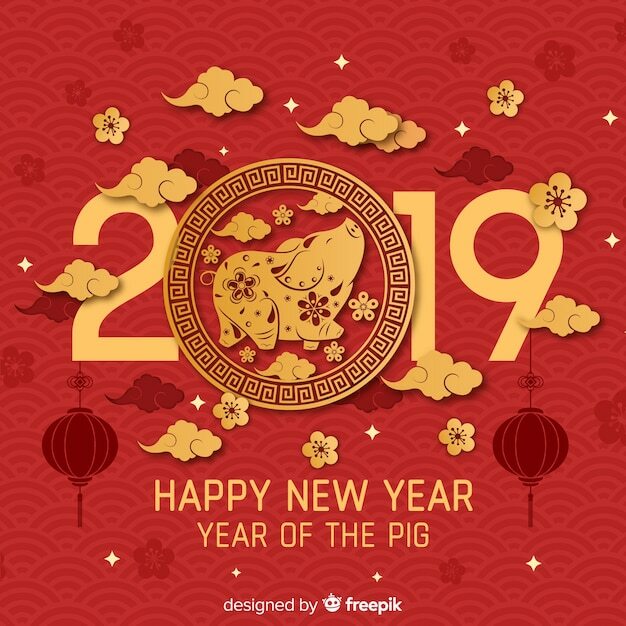 We learned that this is the Year of the Pig. We made Chinese dragon puppets and learned how to write Chinese characters. We even had a Lunch and Show. After we ate Chinese food, the 6th graders entertained us with a Dragon Dance. There were drums, cymbals, and a lot of energy. We had an exciting day! This entry was posted on February 15, 2019. 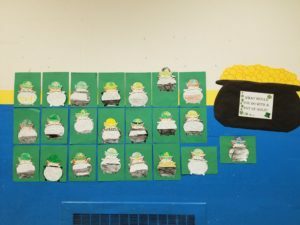 The children had been eagerly anticipating the 100th Day of School. 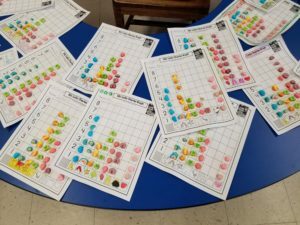 So for the 100th day, we had a celebration with special activities such as making a 100 Fruit Loops necklaces, playing addition games, camouflage the number 100, and making a snow day scene with 100 snowmen. The children read poems about 100. We counted to 100 in different ways. We even read stories about 100. What a fun filled day we had! Groundhogs (also known as woodchucks) are very interesting animals. Our class learned about this animal, who has its very own holiday. 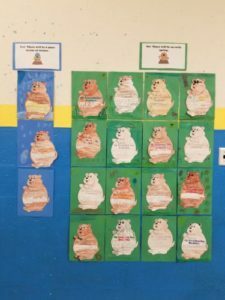 After learning about Groundhog Day and the legend behind it, our class made our own predictions about when spring will arrive. Our class predicted early spring! This entry was posted on February 2, 2019. Our class went to the public library and had a chance to explore around. The children were so excited to receive their brand new library cards and checked out books. Please take note of when the library books need to be returned. Hopefully this is the start of a wonderful relationship with books! 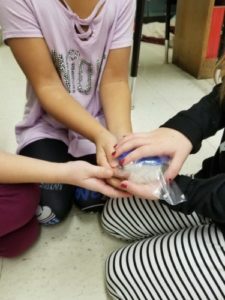 This entry was posted on January 4, 2019 and tagged field trip. Our class is proud to participate in helping others this Holiday Season. We were so excited to be a part of the annual Fifth Grade Bake Sale to help needy families. 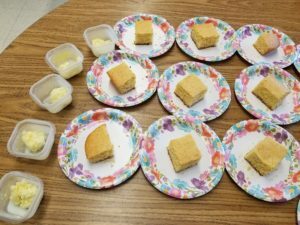 By purchasing baked goods, we helped our fifth grade classes raise money for many families in our community. Way to go! Our class also participated in the Macy’s Believe Campaign to benefit the Make-A-Wish Foundation. Macy’s will donate $1 for every “Letter to Santa” they collect during the Holiday Season. However, Macy’s donated $2 for every letter received on Believe Day (12/7/18). That was the day we dropped off our letters of course. A quick math lesson showed us how the money we raised through these letters can quickly multiply when our Buddy Class, along with other classes, join this wonderful program. This entry was posted on December 30, 2018 and tagged Believe Campaign, buddy class, special event. 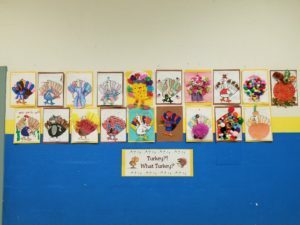 The theme for this week was Thanksgiving. We tried to save some turkeys by giving them a disguise. We wrote what we are thankful for. We learned about the Pilgrims and the first Thanksgiving. We read poems and stories about this holiday. Our class compared and contrasted life in the past with our life today. I think we all agreed that we like the comforts we have now. 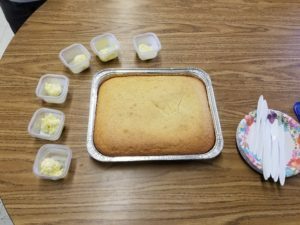 Our mini-unit would not be complete without making cornbread and churning our own butter in class. What a great time we had! 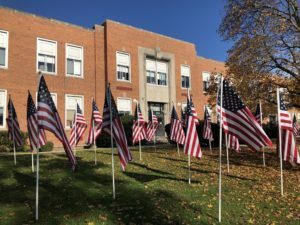 This entry was posted on November 23, 2018 and tagged special event, Thanksgiving. Monsters, and Witches, and Ghouls…Oh My! ‘Tis the season for monsters! 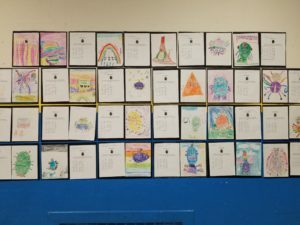 The children worked with our “Big Buddies” to create a math monster. By generating addition equations with dice, the buddies created a “recipe” for their math monster. The equations dictated the number of eyes, ears, mouths, etc. their monster should have. Then they had to use their combined imagination to draw their monster. I was extremely impressed by the children’s creativity. A great big Thank You to the parents who came to our class to help with our Halloween craft. The children had a wonderful time making scarecrows and decorating pumpkins. 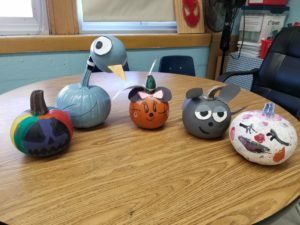 This year’s Literary Pumpkins were amazing! 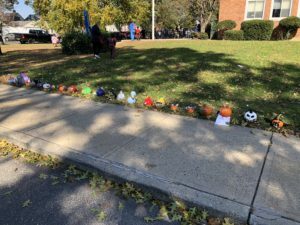 Great job to all who helped decorate our Halloween Parade path. The children looked amazing in their Halloween costumes for our annual Halloween parade. Our class had a fabulous week! 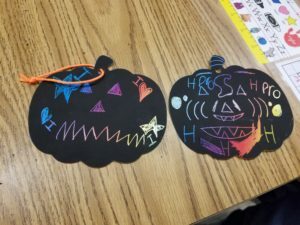 This entry was posted on November 1, 2018 and tagged buddy class, Halloween, special event.